Today’s schedule includes registration and orientation sessions for various groups and several legislative committee hearings this evening. A restful corner: The vast exhibit hall–a favorite destination at every General Convention–opened today. Our own Sisters of St. Margaret are welcoming visitors and taking prayer requests at booth #820 (picture via Twitter @SistersOfStMarg, after last night’s set-up). Schedule highlights for tomorrow, July 4: The schedule for tomorrow, July 4, includes the House of Bishops’ special #MeToo “Liturgy of Listening” event focused on healing and reconciliation, at 6:15 p.m. Eastern time. And, the Union of Black Episcopalians will hold its 50th anniversary celebration. Resolutions scheduled for testimony at legislative committee hearings on July 4 are listed here. Let us pray: Wherever you may be, you can add your prayers to those being collected for daily common prayer at the General Convention. Submit your prayers here. A dedicated team will pray for all submissions, and a selection will be read during the Eucharist each day. Worship services will stream live on the Media Hub, starting with the opening Eucharist on Thursday, July 5 at 10:30 a.m. Eastern. 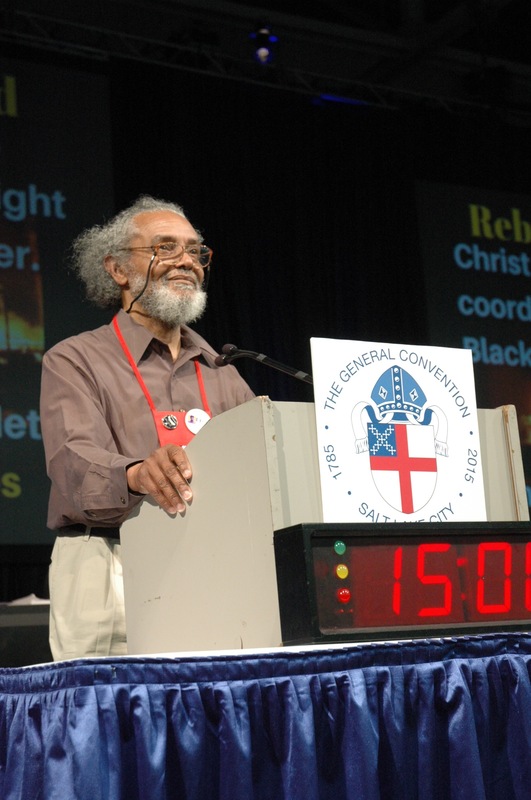 The 79th General Convention of the Episcopal Church will be underway in Austin in just two weeks. Read on to meet our deputation! This will be the 19th consecutive General Convention that Bishop Harris has attended. • Byron has been a deputy to General Convention since 1973. He was the chaplain to the House of Deputies at the 1994 General Convention—the first lay person to hold this position. At the 2012 General Convention he was elected vice president of the House of Deputies; re-elected in 2015, he is serving his second term. He is chair of the Rules Committee and will serve on the Joint Committee on Cuba. • Member of the Dispatch of Business Committee, assigned to support the Prayer Book, Liturgy, and Church Music Committee expedite its legislative work. • Chair, Board of Trustees of the Church Pension Fund, effective after the conclusion of General Convention. In their last video dispatch from the 2015 General Convention, youth observers Megan Lightcap and Michelle St. Francis offered glimpses of their final days in Salt Lake City as well as an interview with one of our lay delegates, who discussed the church’s tension between being excited to see young people engaged in and committed to the affairs of the church, and not being excited to have the status quo challenged. Watch the video here. 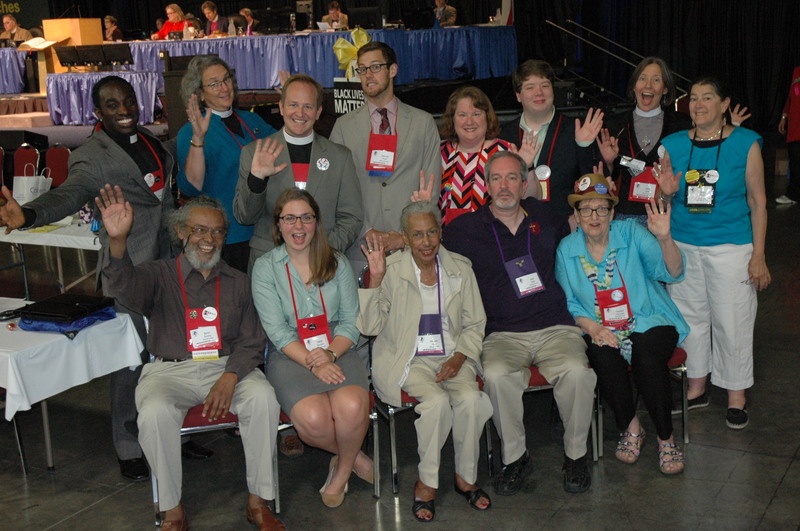 Thanks to Megan and Michelle for their lively documentation of the 78th General Convention! 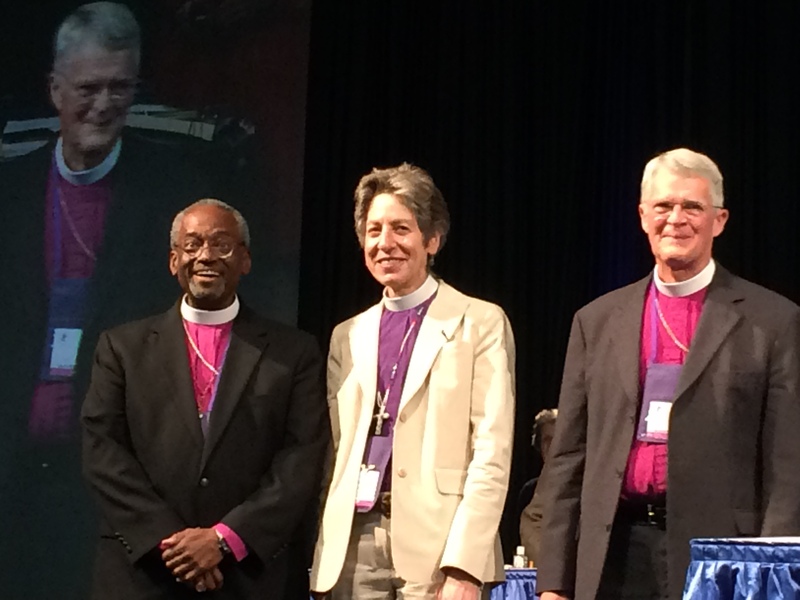 We’re proud of and grateful for the leadership of our bishops and deputies here at the 2015 General Convention. Of particular note, Massachusetts deputy Byron Rushing was re-elected earlier this week as vice president of the House of Deputies. President Gay Clark Jennings noted that Rushing has served the house with distinction for 14 General Conventions and attended the 1970 convention as part of the youth presence. “We are so fortunate all of us in this house to have his wisdom and counsel, his great love, not only for Jesus but for the Episcopal Church. He has been the best to work with, thank you,” she said. You can read more about the election here. 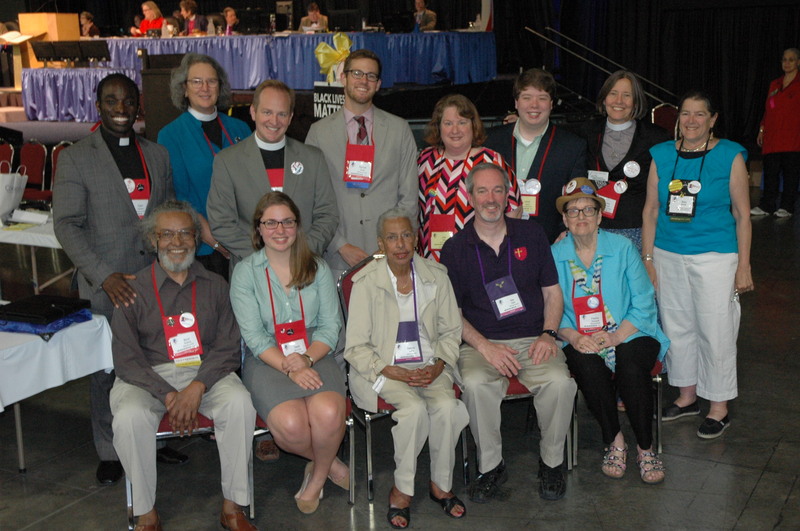 Congratulations also to Massachusetts deputies Mally Lloyd, elected to the Episcopal Church’s Executive Council, and Thomas Brown, elected as a trustee to the Church Pension Fund. Back row: Edwin Johnson, Mally Lloyd, Thomas Brown, Sam Gould, Julie Shea, Billy Boyce, Jane Gould, Betsy Ridge Madsen. Front row: Byron Rushing, Sarah Neumann, Barbara Harris, Alan Gates, Fredrica Harris Thompsett. They are working hard, but having some fun, too. One of the hot topics at the General Convention is the use of social media in communication and evangelism. Discussion around a resolution to support digital evangelism (B009) resulted in a significant number of tweets on Twitter (#YesB009 and #B009). Thanks to Facebook, Twitter, Instagram, and blogs, people not present at the General Convention were able to follow resolutions and to express opinions using #gc78. Whether they were following the results of the election of our Presiding Bishop, offering their opinions on the marriage resolution, or asking questions about the structure resolutions, the participation in the General Convention was broadened and deepened by the use of social media. This leads me to wonder how participation in our church can be broadened and deepened by the use of social media. If #gc78 can trend on Twitter (meaning that it is being tweeted about frequently), why can’t we make the Episcopal Church or our dioceses trend? Over the next three years, the Episcopal Church will be further exploring how to effectively evangelize using digital media. Julie Shea of St. John’s, Winthrop is an alternate to the General Convention. Her trip to the General Convention was sponsored by Episcopal Church Women. “I came to General Convention to support our three bishops. I knew they would be busy in sessions all day so I signed up to volunteer almost every day. The first day I was assigned to register the bishops and deputies and hand out iPads to all of them. We had to explain how they worked to some, but most people were familiar with the devices. The second day I was a page in the House of Deputies and I had to check people at the door and only allow deputies and bishops onto the floor. I only had one alternate give me a hard time. The third day I did registration for visitors and entered all their information into a computer system, including credit card information. The only negative thing about this day was I had to stand for seven hours. The fourth day I sat at the Information Booth and helped people find their way around the massive convention center. It was exciting when people came to the Lost and Found and we had what they were looking for. The fifth day I was a page in the House of Bishops. This happened to be the day of the presiding bishop election so it was an exciting time to be with them. The sixth and seventh days I did volunteer registration, and that is where the attached picture was taken. Bishop Scott Hayashi of the Diocese of Utah came by almost everywhere I volunteered and always asked, “Has anyone thanked you today?” and then he would thank me. He sounded very sincere and I truly appreciated him taking the time to say hello and thanks. Yesterday he wanted to volunteer, so I helped him put on one of our red volunteer aprons. He added the Utah moose antlers headband and we posed for this picture. 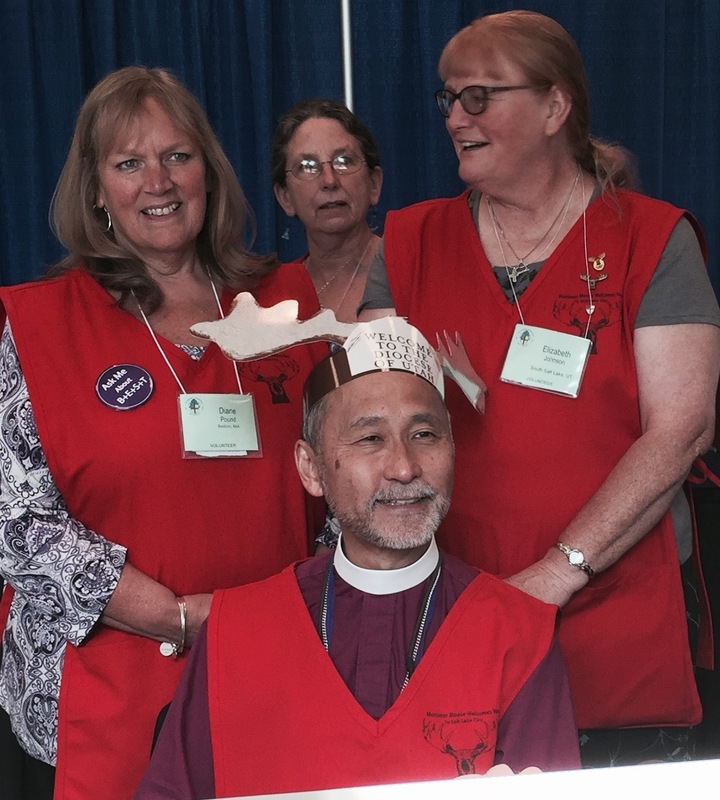 Diane Pound (upper left) helps Utah’s Bishop Hayashi get suited up appropriately to serve as a General Convention volunteer for a day. Curry, Jefferts Schori, Griswold–a “jubilation” of presiding bishops, past, present and future: Massachusetts alternate deputy Billy Boyce got this great shot from the Massachusetts deputation’s front row seats in the House of Deputies during yesterday’s tribute to Presiding Bishop Katharine Jefferts Schori. During yestereday’s joint session on mission, deputies and bishops took time to honor Presiding Bishop Katharine Jefferts Schori as she nears the end of her nine-year term. There was a video tribute, remarks from former presiding bishop, the Rt. Rev. Frank T. Griswold III, and three prolonged standing ovations. Broadcast journalist Ray Suarez, a member of St. Columba’s Church in Washington, D.C., emceed the tribute. “It’s a treat for me to be asked to help say thank you, with a big exclamation point, for Bishop Katharine’s nearly nine years of service as our chief pastor and primate at an incredible time in the life of our church and the communion,” Suarez said. “The bishop I’ve seen in action over these nine years has opened the arms of the church in radical welcome,” he said, “and said things that needed saying but are sometimes kind of hard to hear, but always with compassion in its truest Latin sense, being willing to share the sufferings of those she was chosen to lead and sharing their joys, too. If everybody could be as tender, scholarly, compassionate, dogged, strategic and consensus-building, well, we probably wouldn’t need presiding bishops at all because the work of the church would be close to done,” Suarez said. “God’s mission and ministry of reconciliation have been her theme and her conversion call to us all,” Griswold said. The tribute ended with what Suarez called “a jubilation of primates”—Griswold, Jefferts Schori and Presiding Bishop-elect Michael B. Curry gathered on stage to more cheers and applause.